Our native Android and iOS apps are updated monthly. HTML5 is supported my most new mobile devices. This allows us to have the same app work on the iPad, iPhone, Blackberry, and Android without needing to go through each individual app store. Still want it from the app store? 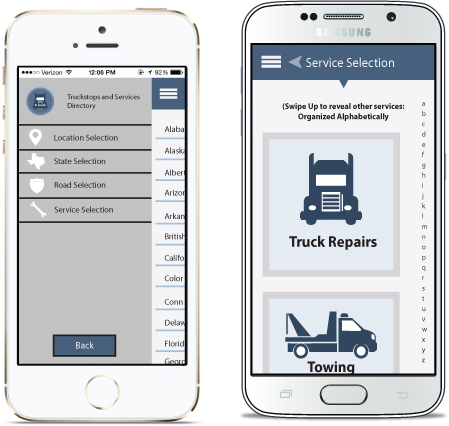 Get the Android Truck stops and services directory on Google Play. If you have hit and miss 3G service, then just go into "airplane mode" and the app will stop trying to check for the newest updates and just run off of the previously downloaded version. Installing the app on each device is a little different but the concept is the same. You just need to "add to your home screen". Once you add the app to your home screen, your mobile device will automatically download and install all of the required files so that your app can run offline. Visit mobile.truckstopsandservices.com in your browser. An icon will be added to your home screen allowing quick access to our entire Truck Stop and Services Directory. We use your location to help you locate services near you. This information is NOT shared with any other business or company. Any ratings or feedback you provide can/will be presented to other users.